Walter Dean Myers is a writer and photographer, a flute player and cat lover. Christopher Myers is an artist and writer, a clothes designer, a dancer. 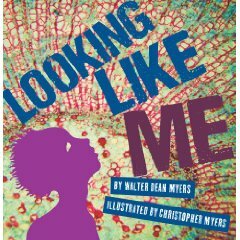 Together this father-son duo created the picture book Looking Like Me, a collaboration that celebrates the concept of every individual having a unique identity. One by one, the young narrator, Jeremy, is greeted by members of his community: A sister, his father, a teacher, the mailman. They give him an approving fist-bump — bam! — and identify him in a different light. To his sister, he’s brother. To his father, he’s son. To his teacher, he’s a writer. Jeremy’s perception of himself (his self esteem) is affirmed by the people in his life. He’s a dancer, a runner, a dreamer. Jeremy is every child. Christopher Myers illustrates the story, which has a bold graphic feel, psychedelic. Photos and textures mix with cut-out figures in every color of the rainbow. Kudos to the book and jacket designer, Yvette Lenhart. Love this book. Just saw it in an indy bookstore. I put it on the reading list for the girls book club I facilitate. Thanks for featuring it. This looks like a great one, Don. I’m putting it on my reading list for sure. Oh, I know a lot of people who’d probably love this — thanks! Sounds like a book that I would enjoy right along with my kiddos. Adding it to the list! This book should win many awards and inspire readers to love themselves. It is quite worthy to note that Yvette Lenhart actually designed the entire book, not just the jacket. And it is the primary reason the book works. The younger Myer’s artwork was originally created for an entirely different project. The father’s poem came later and Ms. Lenhart’s design work is ultimately what made this book’s fantastic message come through.